Do you live in a smaller apartment and need multipurpose furniture to help you save space while doing double duty? 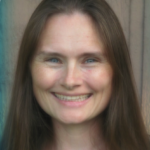 If so, you are going to love this list! Not only will you have more elbow room in your tight space, but you will be able to eliminate extra pieces that are simply taking up too much room. Plus, your small apartment or tiny home will benefit from having an updated, modern look when you incorporate these fun and versatile furniture items into your decor. So what are my favorites on the market and why? Just keep reading and starting clicking to find the sweet deals, awesome designs, and absolutely fun furniture finds that are right around the corner! When we were searching for just the right sofa for our son’s small apartment, we knew that we wanted the extra seating and versatility of having a chaise lounge on one side, but we also wanted the option of having a sleeper sofa. When we found this couch, we loved the simple, sleek design and the ease with which it converts. With just a simple motion, you lift up on the extra attached cushion which then sits on top of a supportive steel frame. 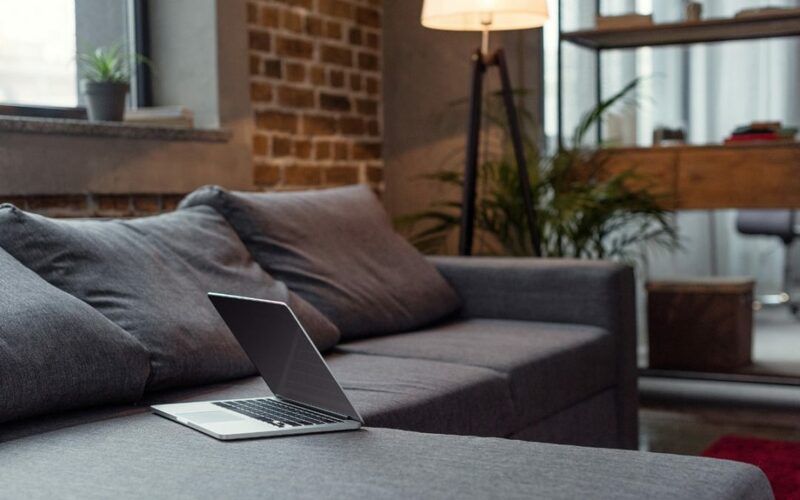 This creates a surface large enough to sleep on and effectively turns the couch into a bed, without the weight and bulk of a traditional sleeper sofa. 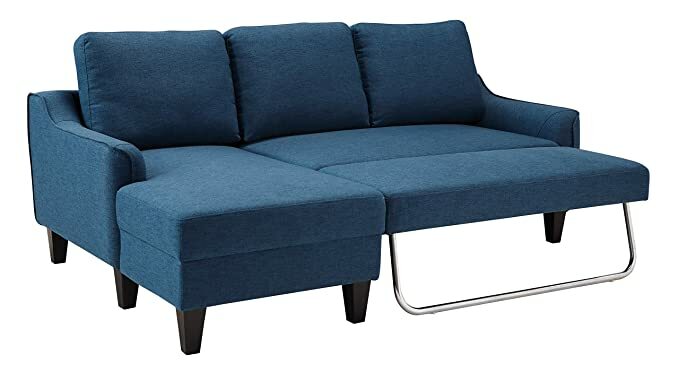 Because this piece of furniture is only a compact 84” in width, it can easily fit into a small living area without taking over the whole room. Yet, it can comfortably hold 3-4 people for sitting. It has a sturdy fabric and though it isn’t plush or super soft, the upholstered foam cushions work great for those who like a firmer surface. It comes in blue or gray and has a contemporary look with a midcentury style. I love how it seamlessly blends with almost any decor and provides a fun place to relax, sprawl, visit, or sleep. It probably doesn’t replace your actual bed, but definitely works great as a spare bed, especially if you don’t have a separate guest room for your visitors. 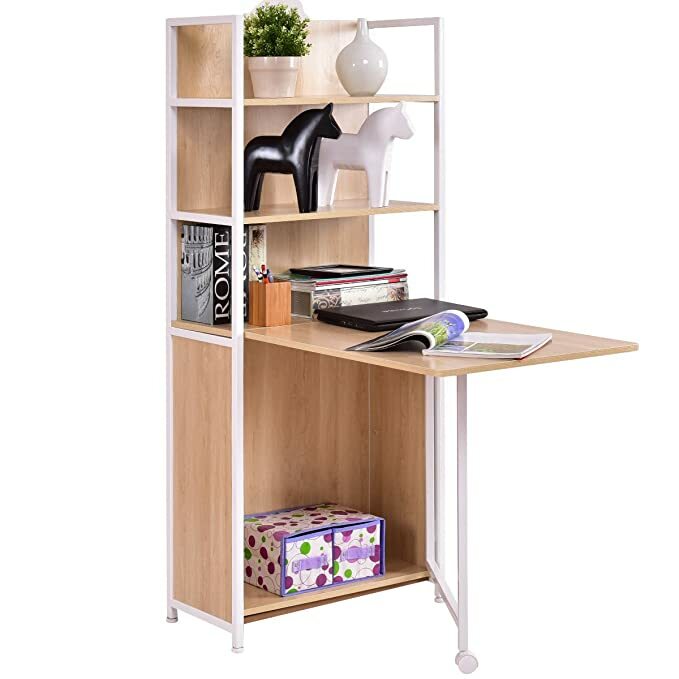 This stylish combo between a bookshelf and a desk is compact and foldable and perfect for a tiny room! Lift up the desk portion, pull out the stabilizing “leg” and voila! You have a full-size workstation at the ready! Since it folds up when you don’t need to use the desk, it can occupy a very small space between uses. The three upper shelves provide easy access to your books and supplies, plus there is one lower shelf that works for storage when the desk portion is lowered. With its unique design of being both a bookshelf and a desk, you really have the best of both worlds without sacrificing a large area. The steel white frame is strong and durable, plus the design is sleek and modern. Overall, 83% of reviewers have rated it with 4 & 5 stars, noting that it was simple to assemble, better than expected, perfect for small spaces, very sturdy, and a great price. This super cool walnut-color table is all the rage for small apartments and tiny houses! That’s because it literally combines your coffee table and dining table into one easily convertible piece of furniture! This is perfect for those of you who may typically eat in the living room, but occasionally need to have more space for a small dinner party with guests. 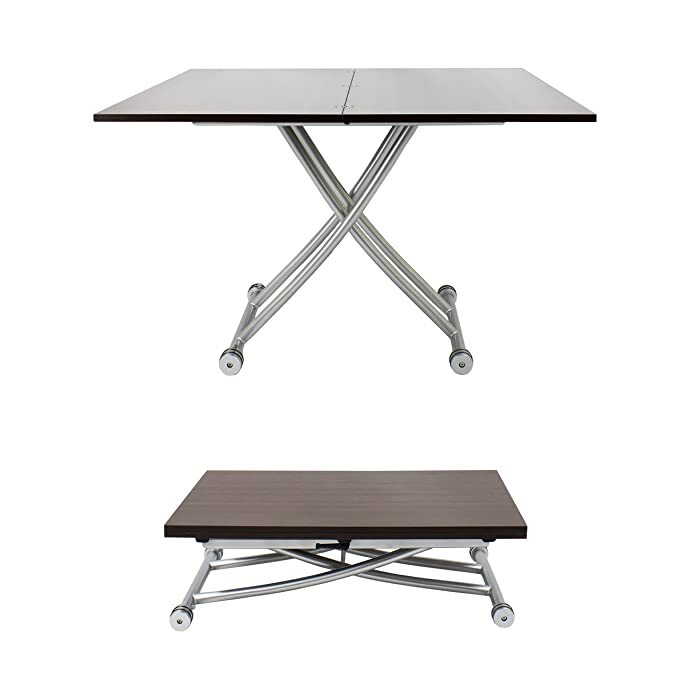 Raising and lowering the table is easy with the innovation of the effortless “X-Lift” mechanism. When converting to use as a dining table, merely rotate the table top and unfold it. It can now easily seat 4-6 people. All of this, plus it is on wheels, so you can merely roll it from your living room to your dining area. What a nifty setup and perfect for filling two important roles in your home! Finding the right furniture to incorporate in your home can be tricky! You will need to decide how to create the best atmosphere possible while balancing both function and design. It’s important to consider the layout of the room, how much walking capacity you need, and the flow of the area. As you consider your needs, make sure that you measure your available space and compare those to the dimensions of the pieces that you are considering. Beautiful and useful furniture can make your home especially inviting and comfortable. This in turn will help your tiny space feel more livable and not so lacking. When you try to cram too much furniture into a small area, however, it can quickly become overwhelming and suffocating. This is where multipurpose furniture really comes into play. By eliminating the need to have so many different pieces, you are able to free up valuable space. This in turn will help you streamline how you live, thus creating a restful zone suitable for rest and relaxation. What other types multipurpose furniture do you like? If you have any favorites, tell us about them in the comment section below!